Social Security Benefits: They’re Important! My (new!) colleague Bob Greenstein handily summarizes the key info from the new Social Security Trustees Report. These things don’t change a ton from year to year—there’s a shortfall out there in a few decades and the fixes for it are known—which is not to say they’re easy. They involve higher payments into the program from current workers, some form of diminished benefits, or some combination. The CBO link above (see Tables 2-4 if you’re up for a good, old-fashioned data slog) shows the different ways to close the gap. But I wanted to make a different point, one that too often gets lost amidst all the high anxiety around entitlement costs. Some people in this debate think Social Security isn’t that important to the people who get it. After all, average benefits are only about $14,000 per year, and sure, it helped a lot of retirees in the old days, but nowadays everybody’s got savings and pensions, right? If you think of retirement as a three-legged stool (savings, pensions, Soc Sec) the latter is the strongest leg. Retirement savings have been lagging for years for many in the workforce due to stagnant wage growth, and pensions have a) shifted from guaranteed (defined benefit) to variable (defined contribution) and b) gotten whacked by bursting asset bubbles. Social Security is that holy grail of retirement security: a guaranteed pension. And, as the figure below shows, for recipients age 65 and up on, Social Security is about two-thirds of their income and that share grows with age—for the old-elderly, it’s closer to 70% of their income. Other data show that for a third of those over 65, Social Security accounts for at least 90% of their income. We should keep these income shares in mind when we think about applying some combination of the fixes to the shortfall. Benefits mean a lot to most retirees and that fact should guide our solution set. Share the post "Social Security Benefits: They’re Important!" 6 comments in reply to "Social Security Benefits: They’re Important!" Many seniors can make extra income by sharing their home,there are millions of people that need affordable housing. Are you serious? This only shows how truly out of touch you are. Most old people would not be able to afford their homes without SS. Renters which make up a significant part of the population, certainly would not have this option, not to mention people that live in one bedroom apts or condos. There are many middle aged people who had to downsize or re-finance their homes just to send their kids to college. Plus, affordable housing is needed for many old people too. Where would they get the money to pay the rent to other old people living in mansions? You state that the chart shows social security benefits as a portion of income. I wouldn’t normally classify spending down savings as “income” – is that how it is classified in the chart, or is income referring to what would be taxable, and therefore likely not include spending from some types of savings? NOTES: The relative importance of a source of income may not accurately reflect the resources available to elderly persons or elderly aged units. The survey on which these data are based does not include some potentially important resources as income, including lump-sum pension payments and capital gains. In addition, these statistics do not take into consideration noncash benefits that supplement money income (housing and energy subsidies or food stamps) or the amount of savings available to supplement monthly income. Consult the Frequently Asked Questions for further information. It doesn’t matter what comprises income–be it savings or earnings. 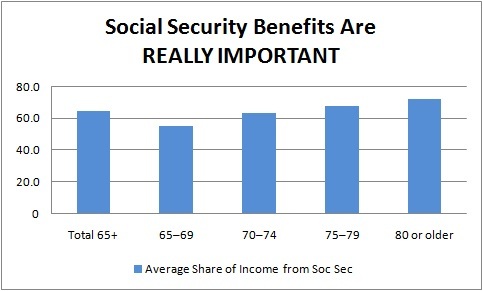 The point is that Soc Sec benefits are a very significant share of retiree’s resources. You’re right to raise the other caveat re what’s left out of income. However, as I pointed out, lump-sum pensions are fewer and further between, and from middle-income on down, most elderly people have very few capital gains. Other subsidies help them make ends meet, but the fact is that Soc Sec benefits are by far the most important. Absent them, the elderly poverty rate goes from around 9% to upwards of 40%. What is the definition of income? Is it taxable income as it appears on the tax return? That would leave out many other resources available such as equity in a house, capital in savings, and other assets the use of which would not turn up on a tax return. The comments really miss the point — unless your goal is to make old people take out reverse mortgages, rent out rooms in their home, etc., and generally make them do the things desperate people do. Anyone who thinks most old people getting Social Security are sitting on a big pile of savings that could support them instead has not done a reality check with old people they know (or with the stats Jared cites). That benefit check is CRITICAL to making retirement work at all in most cases. Before social security, we had misery for the old. We can do it again if we reduce rather than enhance social security benefits. Raising social security benefit amounts is not even in the discussion mix — but it SHOULD be. People need some security in their old age, and this is worth paying taxes for. And that security benefits younger people even before they themselves get old — otherwise, life is a lottery where you stand a good chance of having poor parents move in with you and be a burden on you — which will make both them and you much unhappier.